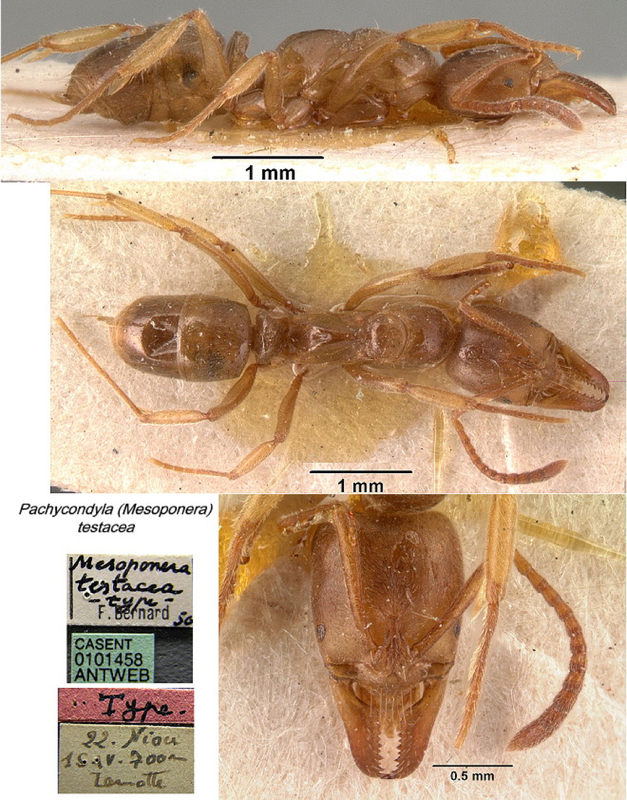 Type location Guinea (Euponera (Mesoponera) testacea, Bernard, 1952: 191, illustrated, worker; in Pachycondyla Bolton, 1995: 310; new placement by Schmidt & Shattuck, 2014: 111) from Mt. Nimba, Nion, at 700 m, 15-iv-1942, collector Lamotte; single holotype worker only described (see Bolton, 1995) . TL 5.2 mm, HL 1.15, HW 0.95 mm. Whole of body and appendages shiny yellow-brown, except the anterior pronotum, the apex of the gaster and the antennal funiculi which are darker. Head and base of mesonotum finely shagreened, with notable puncturation, remainder smooth and shiny. Head dorsum, with widely spaced shallow black puncturations. Fine whitish hairs all over, simple pubescence on the head. Head longer than wide, less accentuated anterior narrowing than Mesoponera nimba; clypeus similar but centrally less convex, overall rather more slender. Mandibles slender, 13 teeth yellow and moderately large. Eyes brown, flat, with some 30 facets, distance from mandible bases about equal to their length. 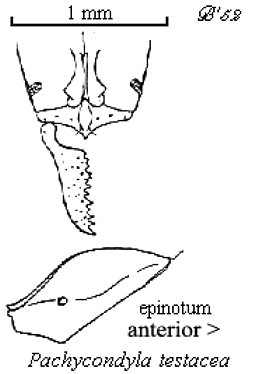 Thorax and petiole notable for the posterior declivity of the propodeum (epinotum) which is shorter than the basal - in nimba the declivity is twice the base length - also less concave. The photomontage is of a worker from Cameroun; Awae II; collector. A Fotso Kuate (fk hypoponera sp2).